Even though the Oklahoma City Thunder are down in this NBA Finals series against the Miami Heat, I don’t think I’m alone when I say that they are not out of it. And even if they don’t capture the NBA title this season, it is clear they are a team that is set up to make several more appearances in the near future to the NBA Finals; most likely facing off against this same Miami Heat team. With Kevin Durant and Russell Westbrook giving the “Big Three” all they can handle, fans are probably wondering what types of collectibles are out in the market for the Thunder? 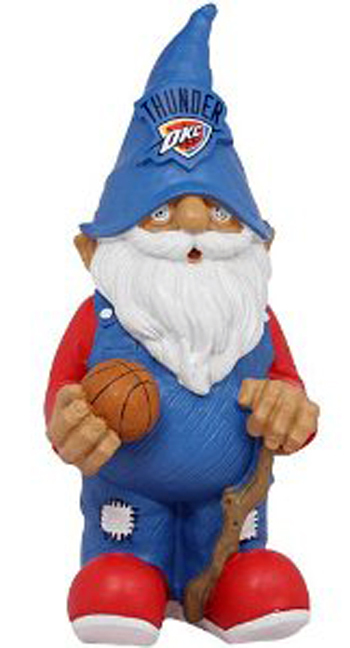 I put together three different lists that can help you find some of the best sports collectibles in the market for your favorite Oklahoma City Thunder players. Most of these items you can find through hobby shops, collectibles shows or on eBay. 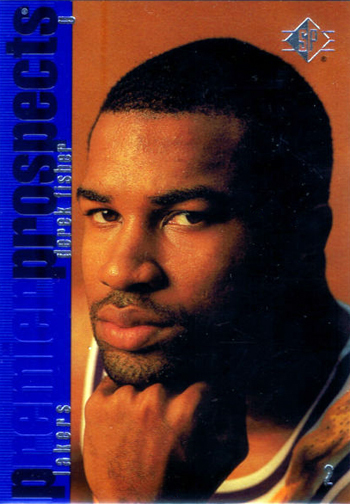 Trading Cards – When it comes to trading cards for the Oklahoma City Thunder, it is important to realize that Upper Deck had an exclusive deal with Kevin Durant during his rookie season. 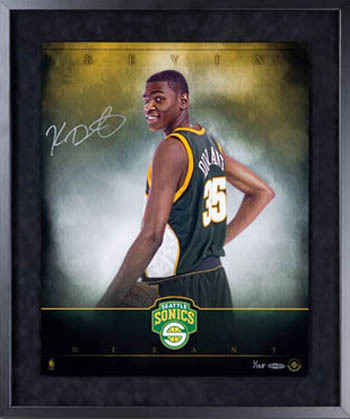 Only Upper Deck branded cards from the 2007-08 NBA season will have autographed rookie cards from Kevin Durant. When you are looking for trading cards for the Oklahoma City Thunder, the most valuable cards are usually from the rookie year so that is what you want to chase. Now some of these can be very expensive, especially from premium sets so it is important to remember many companies produce a variety of product lines to cater to ever budget. For our purposes here, I want to show of some of my favorites, but you can find tons of Upper Deck cards from your favorite players at a variety of different price points. I bet Chicago wishes they had Sefolosha during this postseason. 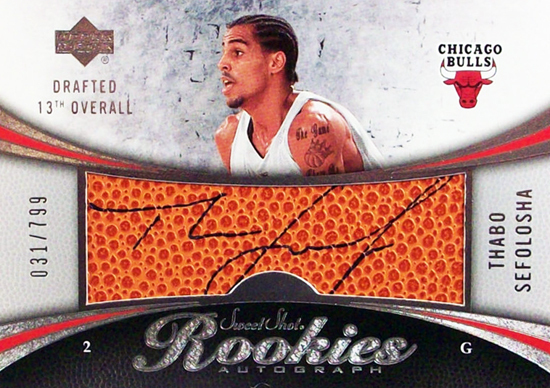 I particularly love this rookie card of his because he autographs on a surface just like a basketball. Very unique. Collison has played very well during this playoff run for the Thunder. His signed rookie can be found at a very reasonable price in the secondary market. The Kendrick Perkins trade is widely thought to be the bump that the Thunder needed to go to the next level and perhaps the reason why the Celtics have fell off a bit. His Exquisite Rookie Autograph Patch card is his most valuable. Derek Fisher is no stranger to playing on the biggest stages. His SP Authentic Rookie card came out the same year as Kobe Bryant's, but his is a lot easier to pick up. Fear the beard! James Harden has been a spark plug for the Thunder and they are going to need him performing at a high level to take home the championship. 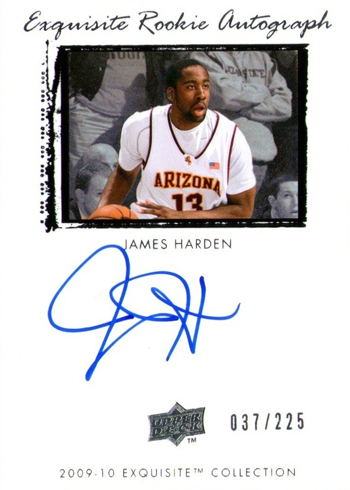 His autograph rookie card from Exquisite Basketball is one of his most valuable cards. Mohammad has been a great role player for the Thunder and it would be nice to see him get a ring. 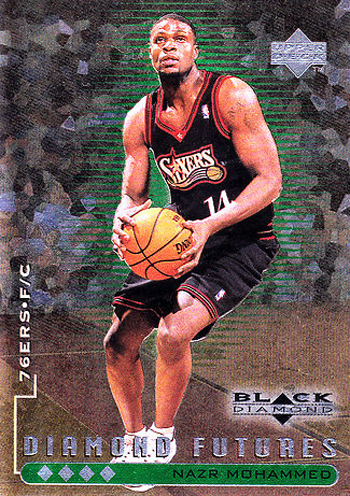 I particularly like his 1998-99 NBA Black Diamond rookie card. 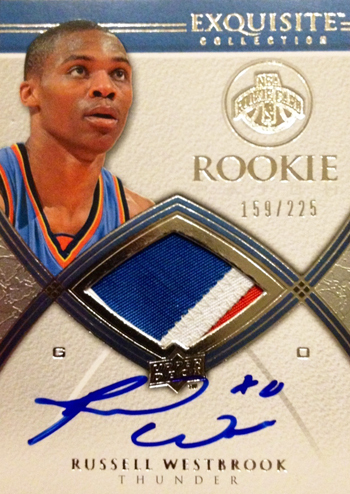 When you get to Westbrook's rookie cards, the values spike sharply up. His most expensive is the Exquisite Rookie Autograph Patch card that sells routinely for over $1000. 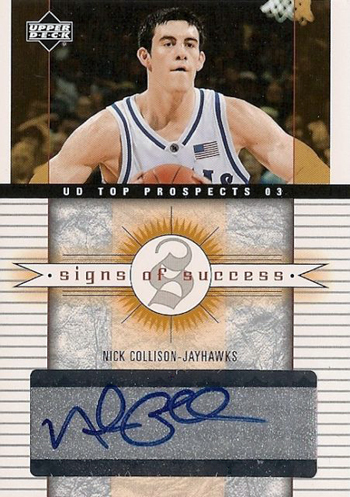 This is one of the most expensive and sought out rookie basketball cards in the market today. 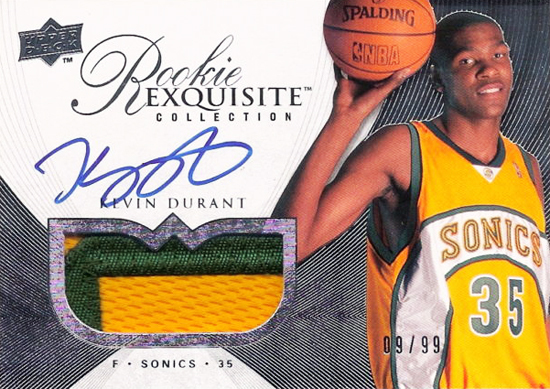 With only 99 copies, Kevin Durant's Exquisite Rookie Autograph Patch card can bring five figures. Now these Upper Deck makes some very limited collectibles known as logoman cards. 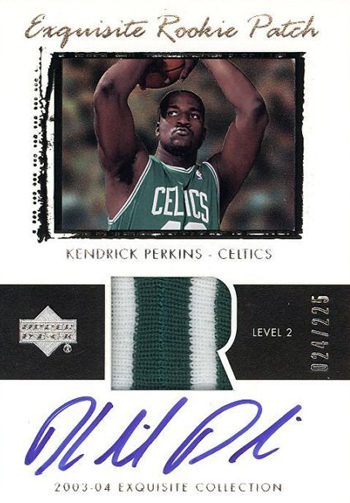 The NBA logo is cut off the game-used jersey of a player and embedded into a trading card that the player later signs. There are usually only one of these cards for a particular player in each release. Here are a couple very unique ones we found and you won’t believe what one is being sold for. Got an extra thousand dollars lying around? If so, it is still probably not enough to purchase this very limited Perkins logoman card. Autographed Memorabilia – When you are looking to make an investment in signed memorabilia, the two most important things to remember is that you are getting the real thing and a quality collectible. 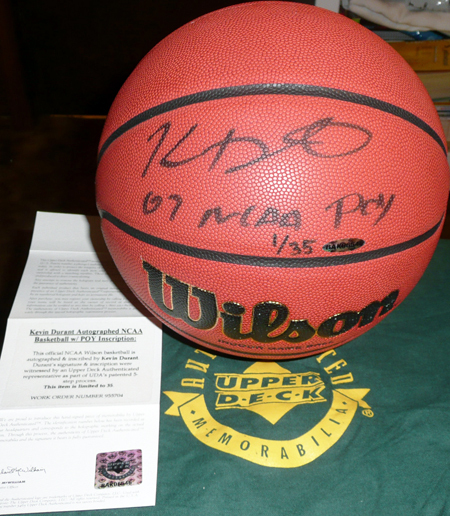 Upper Deck Authenticated worked exclusively with Kevin Durant during his rookie season and was the home for his signed collectibles. There are others out there who are producing collectibles for Thunder players, but you just need to do your due diligence in making sure you get the real thing. Some collectors like to collect signed copies of Sports Illustrated and those can be a good investment. Again, you just need to make sure they are authentic and come with a legitimate certificate of authenticity. 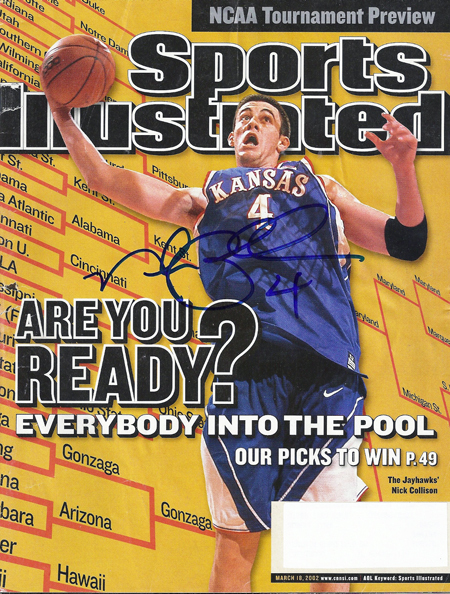 Here's one from Nick Collison when he graced the cover. 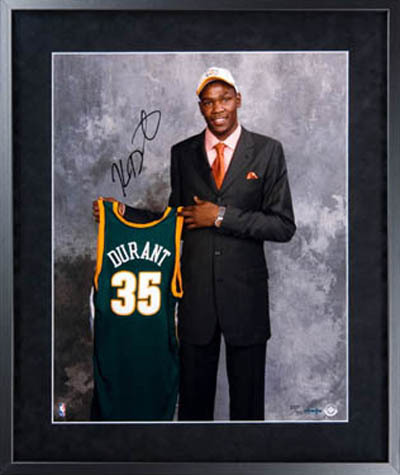 Show everyone you were a fan of the "Durantula" from the get go with his rookie draft day signed photo! There are plenty of collectibles of Durant in his OKC gear, but the Sonics memorabilia is drying up for sure. This Upper Deck Authenticated Collectible can be tough to come by these days. Every Thunder fan needs a Kevin Durant signed basketball. UDA produced a variety during his rookie season with different inscriptions like this one touting him as the 2007 NCAA Player of the Year! 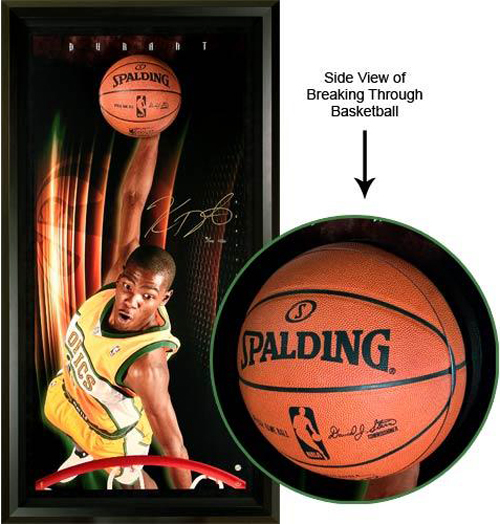 One of the coolest collectibles in the market comes from UDA and it is the Breaking Through display where the basketball comes through the glass. Kevin Durant signed a limited amount of these his rookie season and they are just awesome! Another thing to think about for signed memorabilia is that these players seem pretty accessible in this small market, compared to players on the Miami Heat. You may have some luck with getting them to sign for you in person, but just make sure you bring a couple trusty sharpies and camera along to document the authenticity of the autograph. You may even get them to pose for a picture with you! If I went over to a buddy's house and he had this one the wall, I don't think I would be able to stop making fun of him. But to each there own. 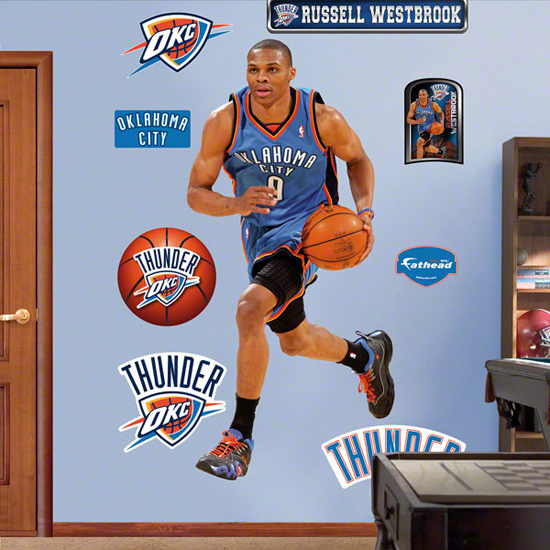 For a young kid, this Fathead collectible could be pretty fun! 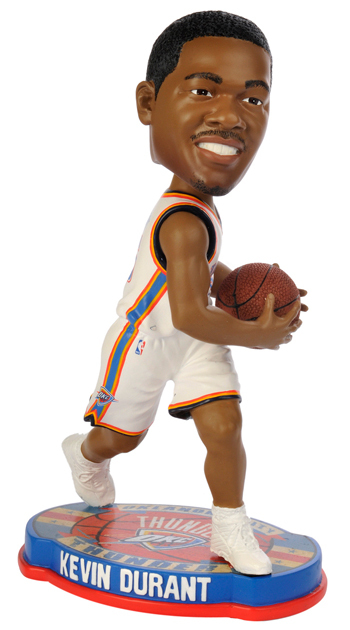 Now here's something every OKC fan needs, a Kevin Durant bobble-head doll! Now this is actually pretty cool. Any Thunder fan would find a good home for this James Harden Banner! These are something you don't see every day. 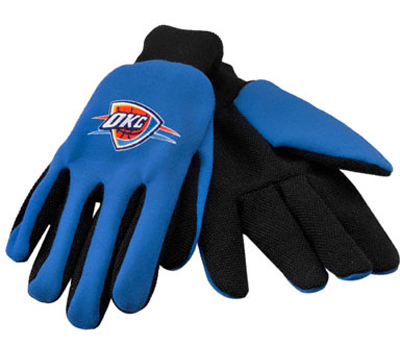 Check out these work gloves for the Thunder. It may be a good idea to wear these while handling your priceless Thunder collectibles!